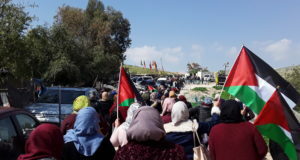 Luban al-Sharqiya, Palestine – Khawla Abdel-Qader Ewes, her husband, sister, and 6 children are facing a daunting situation. They have been living in the village of Luban for their entire lives, and for the past 20 years, this life has consisted of a 7 square meter single room. 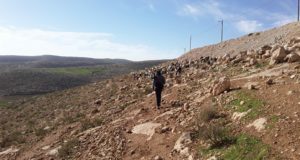 Luban al-Sharqiya is a village of approximately 3,500 people, 5 kilometers southeast of Nablus City. The village is completely surrounded by Area B and C land, while the village itself is Area A as defined by the Oslo Interim Agreement (Figure 1). 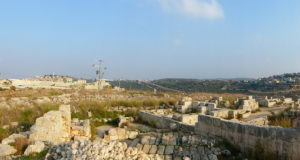 There are several illegal settlements in close proximity to the village. The only means Ewes had to improve her quality of life was to build upon the land bequeathed to her by her father, outside of the village. In order to finance building a new home she was forced to sell her jewelry as well as her current home. This 400 square meter plot of land is located in Area C.
A significant amount of work has already gone into the construction on this home, but last week Ewes received a demolition order from the neighboring government of Israel. The order states that she must go to court on July 2, 2009 in order to start the demolition process. Now Ewes finds herself forced to use the last of her funds to pay a lawyer in an attempt to save her new house. Meanwhile, she will be forced to leave the house her family currently occupies next month. While in Luban, ISM representatives also met Anwar Ballouta whose house was demolished in 2005. He rebuilt it, and has been fighting a demolition order on the new house for several years now. His family’s case has reached the Israeli High Court. However, without the means to pay for a lawyer, Ewes’s case looks much grimmer.